On the 29th September veterans of 6 Gurkha Rifles, 14th/20th King’s Hussars and serving officers from current affiliated Regiments came together for the Battle of Ramadi Centenary event at the Gurkha Museum. Ramadi Day was celebrated both by 6th QEO Gurkha Rifles and 14th /20th King’s Hussars and today their successor Regiments; The Royal Gurkha Rifles and King’s Royal Hussars and Affiliated Regiments continue the traditi0n. At about 6.a.m. 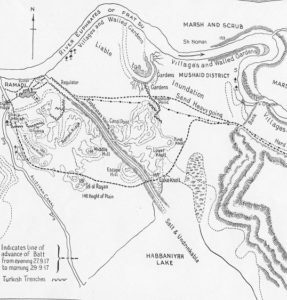 on 28th September 1917 the 2nd Battalion of 6th Gurkha Rifles, less two Companies (A and D) was ordered to attack and capture the Turkish trenches at Mushaid Point in conjunction with the 1/4th Dorsets, whose attack, however, must have been counter-ordered, did not materialise. Mushaid Point was not held by the enemy, but the Battalion while crossing an absolutely open flat piece of ground with no cover, came under heavy enfilade artillery fire from Turkish guns in Ramadi. Shrapnel was bursting all around, but the Battalion came through with gallantry and heavy casualties. On several occasions men were seen to be knocked down. The Battalion then occupied the trenches on Mushaid Point, and while there endured heavy shrapnel fire and some high explosive without having any chance to reply to it. The battle finally ended on 29th September. 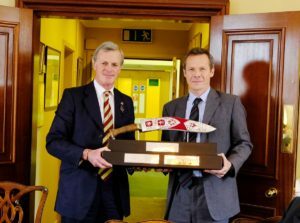 Prior to a lunch a talk was given on the Battle of Ramadi by Brigadier John Smales (14/20 Hussars) and Major Gordon Corrigan (6 Gurkha Rifles). After the lunch speeches were delivered and presentations made. 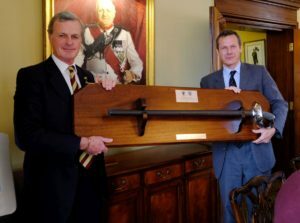 The senior guests were; General Sir Richard Shirreff KCB CBE (Colonel KRH) and Brigadier Gez Strickland DSO MBE (Colonel RGR).